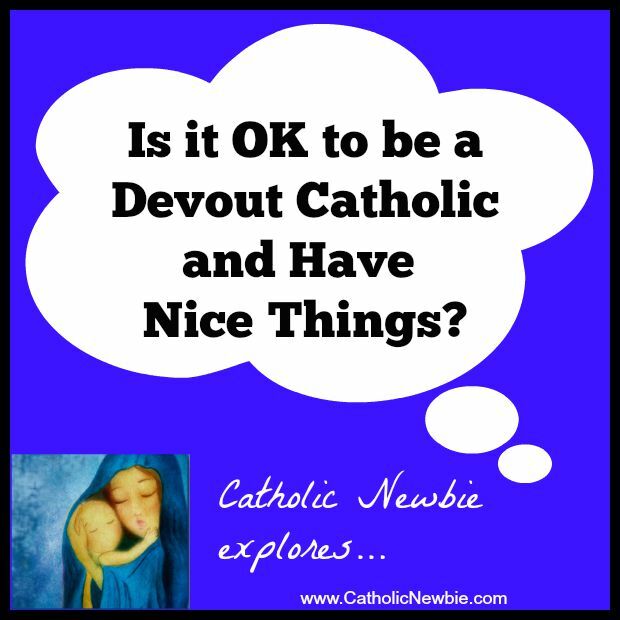 Is It OK to Be a Devout Catholic and Have Nice Things? Today’s Gospel reading (Matthew 19: 16-22) about the young man who asked Jesus how he could gain eternal life drives the point home even further. Jesus told him to sell all his possessions and give them to the poor and the young man went away sad because he had so many “things.” This also turned out to be the discussion last night at my women’s Christ Renews His Parish meeting. Clearly, God has something to say to me — and possibly you since you are reading this post — on this topic ;-). Over the weekend, while reading our local diocesan newspaper, The Catholic Moment, I had a “light bulb” Catholic moment about “stuff.” They write that Pope Francis said that the problem isn’t the having of money, but rather when money “owns” us and when we place our own desire for money and wealth over the welfare of others. They went on to give a great metaphor, saying: “We have to surrender the title to all that we have and all that we are. God holds the title, but still allows us to live in the house.” Lightbulb on! This is precisely what I agreed to do when going through Total Consecration to Jesus through Mary two years ago. I agreed, and still verbalize this daily, to give Mary the right to “all my goods — both spiritual and physical.” I am giving her charge of all my “stuff” and agreeing that I will accept whatever goods she agrees for me and my family to have — whether much, enough or little. And I’m here to tell you that Mary has been very generous, though she has asked us to do without at times, as well. This also speaks to a past article I wrote asking the question: Are Catholic bishops living too lavishly? 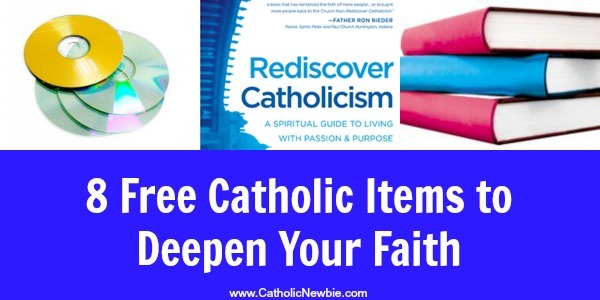 Are you able to easily let go of things, even sentimental things, realizing you cannot take these items with you to heaven? A friend from my CRHP group told us last night how when her father was at the end of his life, she and her siblings were shocked at how his “stuff” fit in 1 shoebox. We truly can’t take it with us! Do you help people financially when they come to you in need or you see them in need? Do you contribute something financially to the causes you believe in? Are these line items at the top of your budget to come out first? Do you have just one or two of each thing you truly need or do you have a stockpile of sheets, shoes or purses, for example? 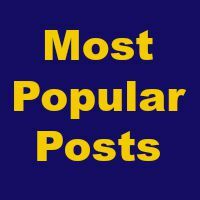 Do you mostly buy things out of need or mostly for pleasure? If you had to, could you live the simple life of a monk or nun in one room with only the basics — without being an ogre ;-)? The young man in the Gospel did not have the right attitude toward money because he went away sad to lose his “stuff,” rather than being open to what Jesus asked him to do with it. I think the bottom line here, which was a revelation to me, is that it’s OK to have nice things and to have money. Instead, it’s more about your attitude toward it and truly relinquishing your right to these things and giving them to God for his distribution. If money controls you, you are a slave to it. If God controls it, you are simply doing God’s will. The MyConsecration.org site promotes Total Consecration to Jesus through Mary and the Flame of Love apparition.A Free Flame of Love book can be ordered in the US at www.flameoflove.us. Are looking for peace in your life? I know that’s what drew me to the Catholic Church. I have the answer: don’t worry, just work! When you are a follower of Christ, you know that you can give everything to Him, or to his Blessed Mother whom he has designated as the dispenser of all grace and our advocate. Jesus and Mary WANT to take your worry and your stress and your anxiety and your problems and give you peace in return. For Gary, the first step in letting go of worry and finding peace is: Prepare. You do this by prayerfully asking God to help you with a given problem and by asking Mary, and any of the saints, to pray for you regarding this problem. Then, you look for signs from God (you WILL see them if you’re paying attention) and do the “work” He is asking you to do. We can’t expect God to take care of the whole problem without us doing our part; however, we need to be sure “our part” is His will and we do so through prayer and careful discernment. Then, do everything that’s in your power to help solve the problem. If you need a job, polish your resume and look for work. If you’re sick, go to the doctor and follow his or her orders. If you’re having a problem with a family member, speak the words you feel called to say, asking the Holy Spirit to speak through you. Then… let God do the rest. His will be done! And be at peace. Gary gives several wonderful examples of this process in the Bible. First is the multiplication of the loaves and fishes. Jesus gives the apostles work to do: ordering the crowd and distributing the food. The apostles did the work and Jesus performed the miracle, creating more than enough food for everyone. Another example would be the Wedding Feast at Cana where Jesus began his public ministry. After Mary’s statement that the married couple had no more wine, Jesus directs the workers in filling jars with water. Then… HE performs the miracle that solves the problem. I recently had a similar issue with my mother, who was completely against moving to a new home, which really is a necessity for her financial stability. I had done everything I could to help her with her finances and run out of options. Out of no where, a friend suggested this VERY SAME new place to live and she was suddenly miraculously convinced that it was not just the right thing for her but something she really wanted to do. I did the work I could; God performed the miracle. Thanks be to God! This has happened to me so many times in the last couple years since becoming Catholic and especially since consecrating myself to Jesus through Mary and praying the rosary daily. If you pay attention and give your live over to God, these things will happen to you. I hope you are able to recognize them as the work of God and remember to give thanks :). Let these miracles uplift you as you encounter the next problem in your life. Do you see how this works? 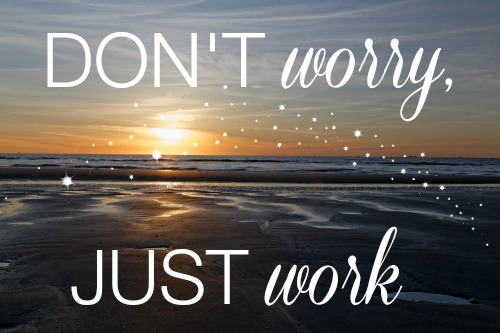 Can you stop worrying and just work? Totally trust God to do the rest? You will be blessed in abundance if so. Even if His solution is not your solution, you will have peace about it — whatever it may be.